Headlies: Kane Sues Finn Balor for "Demon" Infringement - WrestleCrap - The Very Worst of Pro Wrestling! 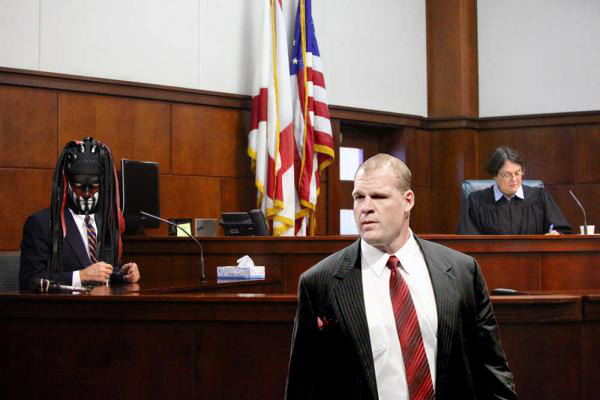 Dover, DE – The trial of the century began today in a Deleware courthouse as WWE Superstar and Director of Operations Kane sues former WWE Universal Champion Finn Balor for gimmick, copyright, and “Demon” infringement. The scene was tense inside of the court house as Kane, who was representing himself, addressed the court. He looked at Balor, then at the judge, before addressing the jury directly. Balor’s court-appointed lawyer, former WWE manager Clarence Mason, took his turn addressing the court. Later in the day, Balor took the stand and was cross-examined by Kane. “Please state your name for the court,” said Kane, looking over his notes. “Finn Balor,” he quietly replied. “You once wrestled under the name ‘Prince Devitt’. Is that correct, Mr. Balor?” asked Kane. “Yes, I…” started Balor before being interrupted by Kane. The judge ordered the court to take a one-hour lunch break. Kane went to a cafe down the street where he enjoyed a turkey club sandwich, potato salad, and an unsweetened ice tea. Balor hid in the courthouse bathroom and cried. 8 Responses to "Headlies: Kane Sues Finn Balor for “Demon” Infringement"
Jury members Fake Razor Ramon, Fake Diesel, Fake Doink the Clowns, Fake Black Scorpions, Other Fake Kane all listened intently and wished to themselves they could be Fake Roman Reigns. If I were Balor I would fire Clarence Mason as his attorney and use Johnny Cochrane instead. This trial would go much quicker than a few months if Balor did that. And on the plus side, he might even win. Kane has a great case though, he just needs more hell fire and brimstone going as he yells at Balor, Mason and everyone else. You didn’t mention the name of the Judge tho. I assume it’s Judge Judy as no other judge can hold a straight face while clowns and wannabe comedians get up in front of her and present their feeble mortal cases in front of her almight immortalness. Judy: “Did I ask you to tell me of your client? He is guilty of ripping off a demon gimmick and is therefore guilty of demon gimmick infringement. (does an announcer John Cena voice) There can only be ONE! (goes back to normal voice) and that ONE is Kane. 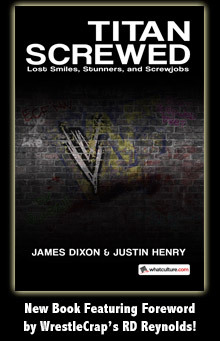 All we need now is Sid Justice to be the judge and we got a whole room full of wrestlecrap. How we forget the most important judge of all, Judge Jeff Jones of ECW fame. Well it could be worse…one of them could have hired David Otunga and then there would be either legal meetings like during that one Sheamus feud, or a lot of rambling like he does during SmackDown commentary.